With Valentine’s Day right around the corner, billboards are switching gears from the Super Bowl to hearts and love. Check out our top five Valentine’s Day billboards! With Deadpool’s premiere on Valentine’s Day, the movie created billboards that looked like it was for a romantic comedy. Marketing Deadpool as a rom-com captures the attention of an audience that would not normally be interested in the action/comedy but is a laugh for those who know what the movie is really about. Whether people managed to trick their significant others into seeing what they thought was a romantic comedy or simply just made people laugh, this billboard was perfect for Valentine’s Day! This billboard is incredibly simple. With only one word and the bold red, this billboard is hard to miss! With no intention to sell anything, this billboard it stands out and reminds people what is truly important. Just in time for Valentine’s Day, this billboard’s intention is to spread love. Telstra allowed people to send in their names to be displayed on their digital billboard for Valentine’s Day. They got people involved in their advertising and created excitement for people to see their names lit up on the huge bulletin. This tactic guarantees people sharing pictures of your billboard all over social media, reaching thousands of more people than just the billboard alone! This simple design showcases the perfect gift for Valentines Day. The billboard’s placement is great! It is at eye-level in a busy area and is the only thing to look at as pedestrians ride down the escalator. Swarovski’s billboard has a clear call-to-action stating where the store is located and the special valentine’s day sale. 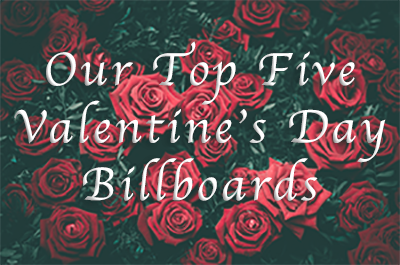 Find your billboard match at BillboardsIn and get our Valentine’s Day outdoor advertising campaign started!